The poppy has become a symbol of respectful remembrance, and as such has become a conundrum. 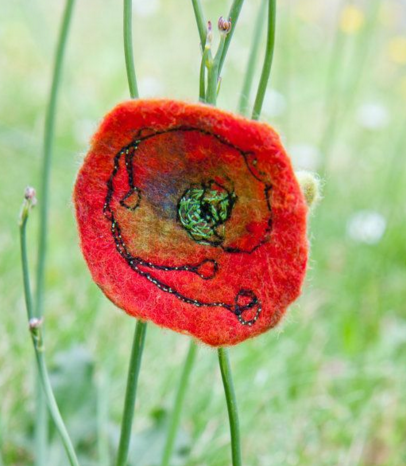 I was brought up to believe that the red poppy was a symbol of remembrance for the fallen of the two world wars. My father was a survivor of a Nazi concentration camps and so it was always a time of poignancy in our household. But as time goes on, these things get manipulated, and I have learned a lot of history along the way too. My perspective has changed. The history of the now traditional remembrance ceremonies is in itself enlightening. On the first Armistice anniversary, Tuesday November 11, 1919, the country did indeed fall silent for two minutes. At the signal – church bells, flares, even gunfire – traffic stopped, people stood still in the street or stepped away from their work, machinery (and every telephone exchange) was turned off, nobody spoke. In some schools there were special assemblies for the Silence, in others people just sat quietly at their desks. The impact of ‘the Silence’ on the people was enormous. The whole of everyday life could be halted simply by everyone joining together to do it. Most people found that very impressive and moving. Many thought it felt like a religious ceremony. The government almost immediately decided to make it an annual event. In the years that followed a spiritual element was encouraged as an important part of Remembrance ritual. So were ideas of ‘victory’ and ‘glory’ and ‘sacrifice’. All these were ways of trying to make sense of so many needless deaths, which had filled people with horror. The fate of ‘our glorious dead’ was desperately sad, but the word ‘glorious’ gave it false grandeur. The idea that these British soldiers had ‘given’ their lives was misleading, considering the reality of conscription and the use of propaganda that led them to their fate; the word ‘sacrifice’ gave the idea nobility, while it should have reflected that they were innocent lambs to the slaughter. There is nothing grand or noble about war. War makes everybody victims. War makes people bring needless death upon themselves and those around them, friend, foe, or anywhere in between. So, right from the outset, remembrance was used by the establishment, that had caused and inflicted war on everyone, to manipulate our reflections on the horrors. Scarce heard amid the guns below…. So the Americans arranged for artificial poppies to be made by women in war-ravaged northern France. The funds raised from selling the poppies were for children who had suffered because of the war. In Britain, the weary soldiers came back from the grimness of war to find that life was hard at home too, though in a different way. Many of the men were wounded or disabled or suffering the effects of gas and shell-shock. Many were physically or mentally unable to work; many others found that there were no jobs anyway. The provision made for them by the state was less than adequate. They certainly didn’t get the heroes’ homecoming that they had been led to expect. So ex-servicemen’s societies united in 1921 to form the British Legion. 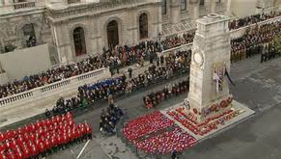 Its purpose was to provide support to ex-servicemen, especially the disabled, and their families, and it was to become one of the most successful British charities ever. A Frenchwoman, who was helping to organise the production of artificial poppies in France, suggested that the British Legion might like to sell them to raise money. The British Legion approved of this idea, and ordered at least 1.5 million for November 11, 1921. They sold out almost at once. 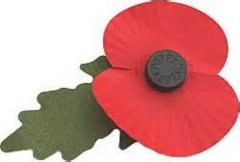 The first Poppy Appeal made £106,000, a huge sum in those days. The British Legion then decided to set up its own poppy factory, with disabled ex-servicemen making up the workforce. The Remembrance red poppy rapidly became an established part of British life. Unquestioningly so for the vast majority (as ever)! For those of a more questioning disposition, however, there have been issues and problems as it has been politicised and even became a cause of stigmatisation. Some people who have chosen not to wear it have faced anger and abuse. In Northern Ireland, for example, it became regarded as a Protestant Loyalist symbol because of its connection with British patriotism. This perspective has been eloquently presented for a few years now by an unlikely source – a Premier League footballer. Derry-born James McClean, of West Brom, may well be the only Premier League player again this year not to wear the special edition shirts with red poppies on them. He explains why he has taken this stance since 2012 here. A growing number of people have been concerned about the poppy’s association with military power and the justification of war. The official line these days is that the British Legion poppy is not in recognition of the fallen in the two world wars, but about caring for all British soldiers that have died or fallen in the line of ‘duty’, past and present. But why, with a state welfare system, are the services of the British Legion (slogan: ‘Honour the dead, care for the living’) still needed; some say it’s disgraceful that they were ever needed at all. In fact, rather than not be needed, Help for Heroes has come along (in 2007) to crank up the help for servicemen severely hurt, doing the government’s current dirty work for them, and redoubling the the propaganda of glorious, heroic sacrifice. To be honest, I have no time for this at all. Heroes? What heroes? Perhaps the RAF pilot who recently declared he would have refused the order to bomb the MSF hospital in Kunduz. Perhaps Chelsea Manning, for making clear the extent to which we are lied to and have despicable acts done in our names. This is why a growing number of people have become uneasy about what the red poppy has come to represent. It has become jingoistic and nationalistic. Remember the ‘glorious’ soldiers defending British (government) interests. Let us not dwell on the ‘enemy’ combatants killed; and we better not mention the multitude of innocent civilians killed and harmed by our ‘heroes’ in far off lands. Thus the growing appeal of the ‘rival’ white poppy. Again, a history lesson is worthwhile. The Women’s Co-operative Guild, founded in 1883, began its life preoccupied with the problems and issues of home and family, but by 1914 attention had turned to the bigger picture: the Guild’s Congress declared that ‘civilised nations should never again resort to the terrible and ineffectual method of war for the settlement of international disputes’. By the end of the war the guildswomen had learned first hand the extent to which war could profoundly affect and harm their lives. Many of them were the wives, mothers and sisters of men who had been killed. They embarked on an active campaign for peace. By 1933 they were searching for a symbol which could be worn by guildswomen who wanted to show publicly that they were against war and for nonviolence. Someone came up with the idea of a white poppy. Workers from the Co-operative Wholesale Society began making the poppies almost at once. Money from selling them, after the production costs had been paid for, was sent to help war-resisters and conscientious objectors in Europe. 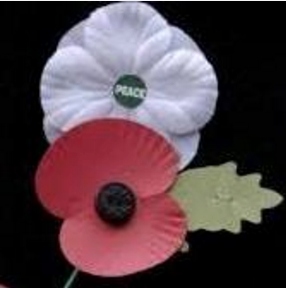 The wearing of a white poppy on Armistice Day became a focus for the peace movement, and the Peace Pledge Union took it up in 1936 as ‘a definite pledge to peace that war must not happen again‘. In 1938 ‘Alternative Remembrance’ events began: a pacifist religious service was held in London’s Regent’s Park, followed by a march to Westminster and the laying of a wreath of white poppies at the Cenotaph. 85,000 white poppies, by then an acknowledged symbol of peace, were sold that year. Many people wore them alone, others wore a red poppy as well. Given my upbringing and my father’s story, if I wear a poppy at all, my first choice is a white one, but I feel most comfortable with a red one alongside it to acknowledge the tragedy of young men on all sides duped into combat for reasons they didn’t understand by an establishment that had (and has) no respect for humanity. That the red poppy has been highjacked by those same establishment interests is a pity, but at the end of the day can we ever be surprised by that anymore? This in itself is progress of a sort. This entry was posted in Uncategorized on October 31, 2015 by Bridgend's Green Leftie. The only war worth fighting is the Class War, and that must be fought until total victory! No problem, Samuel, and thanks for the referrals.